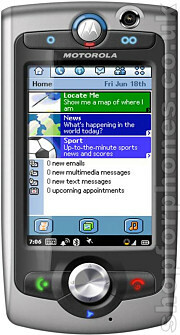 The Motorola A1010 is the latest in a long line of A-series 3G handsets, each one adding more features than the last. This is a powerful smartphone running the Symbian operating system, meaning that the Motorola A1010 can run a variety of different applications and do much more than a standard handset. The large 208x320 pixel display is touch sensitive, has advanced handwriting recognition capabilities and can be used in either landscape or portrait (wide or tall) modes. One the back of the Motorola A1010 is a 2 megapixel digital camera, and there's a sub-camera too, enabling full 3G video calling. The A1010 can play back a variety of multimedia files, including MP3 audio and various video formats, but it can also allow you to view many different types of Microsoft Office document, which when combined with the A1010's excellent email capabilities make it a very powerful business tool. There's a capable web browser built in too. Memory is expandable up to 256Mb using TransFlash cards, and the A1010 can also be connected to a PC using Bluetooth or a USB cable. In addition to being a 3G phone, the A1010 supports tri-band GSM and GPRS so you can use it in places you can't get a 3G signal, meaning that you need never be out of touch. Available in late 2005. Please subscribe to our newsletter for updates. If you want more information on the Motorola A1010, subscribe to our mailing list. Also, the Update newsletter contains general news about new phone releases.